So I’ve spoken before about how much I froth over controller augmentation. It’s my guilty pleasure, and it’s something that has begun to spiral out of control. I now own more PS4 thumbsticks than I thought ever possible. And yes, I do use them all on the regular, they’re my hand’s tiny plastic children. On my last ravings about how good thumbsticks are, I spoke about the KontrolFreek S.C.A.Rs, which are the COD Infinite signature model. This time out we’re looking at the Destiny CQC signatures. I already own a set of the standard CQC sticks, and they have been a favourite of mine for some time, they are versatile and the relatively low height makes them great for pretty much any game, so I was keen to check out this variation. 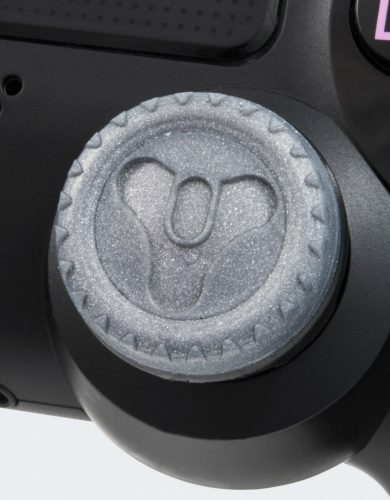 Not being a Destiny fan I was apprehensive about whether I’d like them, but to my delight they have a lot more going for them than just the engraved Destiny logo. The design of the sticks provides so much more control than the standard GQC, and they feel a lot more comfortable for extended periods of play. Around the stick there are notches that allow your thumb to rest snugly, something that the normal GQC sticks lack, and it really is something that makes a difference. The logo in the centre is also deeply engraved, proving an additional control boost. If like me you are prone to sweaty hands during tense gameplay, then you’ll appreciate these features. The height of the sticks is considered medium, providing an 8mm boost from the default PS4 stick, which seems to be just the right height for most games. Due to the nature of medium sticks I find they might not provide a drastic boost to accuracy for FPS pros, but they help with control and comfort. Those looking for a large increase to accuracy should probably go for taller sticks such as the Snipr model, or variable height sticks like the Galaxies, but be aware those taller sticks can be sensitive at close range. If you’re unsure whether thumbsticks are for you, or you’re unsure which type to go for, these would be the ideal ones to test the waters with. If you want controller advice, Charlie’s your guy! Seek his wisdom on Twitter @clbraith and don’t forget to follow @load_screen and like us on Facebook.